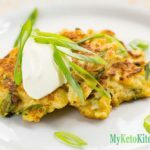 Traditionally Latkes are a potato pancake, we’ve made them Keto Friendly by using Cauliflower to make our Low Carb Latkes. You’ll barely notice the difference! Grate the cauliflower and place into a bowl, add 1 teaspoon of salt and mix well. Set aside for 20 minutes. Spoon the cauliflower into a piece of muslin cloth, or into a clean tea towel. Squeeze out as much liquid as you can. Place the squeezed cauliflower into a clean bowl and add the remaining ingredients, except the butter and sour cream. Mix well. In a large non-stick frying pan, add the butter and heat over medium to high heat. When hot, add spoonfuls of the cauliflower mix and flatten out into small pancakes. Fry on each side for 2-3 minutes until golden brown and cooked through. Serve with a tablespoon of Sour Cream.